How to replace photo in moderncv classic with a QR code? I am making my resume using the moderncv package with the classic style. 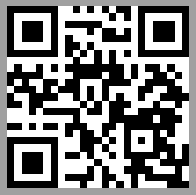 I wish to replace the photo with a QR-code to my personal website, using the qrcode package. How can I achieve the desired goal? I now understand that \photo is essentialy a wrapper for includegraphics, and therefore expects a file path and/or file name as its argument. Is it possible to re-define \photo to be flexible enough to accept either a latex command or a graphics file path and/or file name? Failing that, at least is it possible to automate the inclusion of a QR-code image that automatically updates whenever the URL argument to the \qrcode command is updated i.e. avoid compilation of multiple documents? In the code of class moderncv, style classic you can find an if-then-else construct checking if a \photo is defined (printing it) or not (doing nothing). I added inside the empty case a new if-then-else testing, if a new command \qrphoto is defined. If it is defined the code prints it, in the other case it does nothing. With this command I define the needed values \@qrphotowidth etc. for later usage. The command \raisebox[1cm] is needed to get the qr-code on the right position (I did not search for the reason, why I need it here. The used value is okay for sizes of the resulting qr-code of 2cm (I used for the example code) or more. If your qr-code should be smaller you need to change my used value of 1cm to a lower value. You will have to try it out. As you can see I deleted the command \includegraphics. With command \qrphoto \qrcode... from package qrcode. for example you can add an qr-code-image with a hight and width of 2cm, a frame around it with a line of 0.5pt and the content of the qr-code-image is https://tex.stackexchange.com/questions/474546/ (this question). Please note that you can only print a photo or a qr-code. If you have a defined \photo and \qrphoto only the photo is printed! \photo command wants a file suitable to be included with an \includegraphics command. 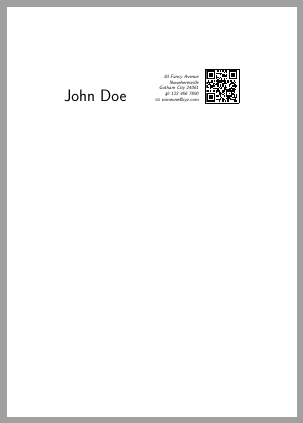 Therefore, I think the easiest solution would be to create your own qrcode within an standalone document and use the result as photo in moderncv. Not the answer you're looking for? Browse other questions tagged graphics moderncv includegraphics qrcode or ask your own question. How to include a photo into moderncv?